Tim Mullooly: Welcome back to Living with Money. This is Tim Mullooly. 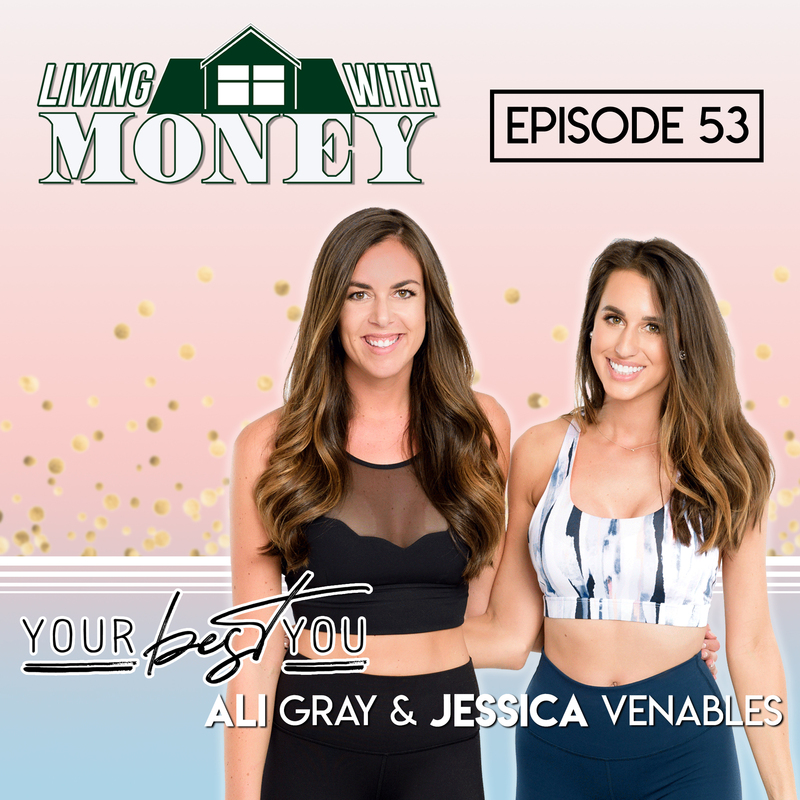 On today’s episode, I am joined by Ali Gray and Jessi Venables, two sisters who have founded and currently run the growing community called “Your Best You”. Today we’re going to hear all about their community, and their journey with it so far. So, ladies, thanks for joining me on the podcast. Jessi Venables: Yay, thank you so much, Tim. We’re so excited. Tim Mullooly: Do you guys first want to just briefly introduce yourselves, and give us a little background about your own individual journeys up to this point? Jessi Venables: Well first of all, Tim, we want to say thank you. And we’re so honored to be on this podcast and be able to connect and link up with someone like you, who’s on a similar mission to really help impact people and motivate them in their journey in life and achieving really the best version of themselves, right? So thank you so much. We’re so excited to be here. And share a little bit about our personal journey and mission and hopefully inspire some of the listeners. So I think our journey really starts with my sister, Ali. So I’m going to have you kick it off. Ali Gray: Hi, guys. Yes, thanks so much. I’m going to rewind back a little bit, to about two and a half years ago. It was coming up on summer. I was about to marry the man of my dreams. I was wanting to feel really good for the big day. I was juggling some crazy hours at the hospital. I’m a nurse. I was working for a medical device company, and working call weekends, holidays, you name it. Not a surprise, but I wanted to feel my best for the big day, but also wanted to just get out there and be able to enjoy. I love to travel, had some fun events coming up, birthdays, barbecues, all that fun stuff then. I actually reached out to a total stranger on Instagram. And I had just seen, from her journey, that she was feeling amazing and surrounded by awesome community, and she talked about this nutritional rebalancing system. And I didn’t know all the details yet, but I reached out to her, and I was like, “I just have to give this a try. It sounds so cool”. She’s living a balanced lifestyle, feeling really good, and I inboxed her for some more information. I customized my brown box, Superfoods, as we call them, and really at the time, just had a short term goal of losing some weight, toning up, and really just like fueling up for a fun summer. That was really that. After a few months, though, I realized, I had gotten started on a journey that was about to be so much more than I signed up for. I knew that the products were going to make me feel amazing. I had so many transformations and read some testimonials of other people, aside from this friend, who were also feeling so good. So that was kind of a given. But after some time and after losing some weight and feeling really good, I really sat down and just thought, “Wow, I have looked for something like this for a lot of my life”, and just was more energized, my skin was clear, I felt so much more positive and just excited about life, which is so creepy because, like I said, I was just trying to lose some weight. And that was when I really thought to myself, “There are so many people, including friends and family, who I would love to be on this journey with, who also might have similar goals and might want to get involved”. It was actually kind of mean that I hadn’t told them about it. Just from following along with my friend, Mackenzie’s journey, I saw that there was an opportunity to kind of along this nutritional rebalancing system. Something that I had done with all the other things I liked anyway, just like when we’d try a new restaurant, or go somewhere really cool, or something like that. We’d tell our friends about it. It was really just the same thing to me, except that I would be able to make some extra income with it, which sounded really fun, and was really just a little outlet, I guess you would say, outside of my busy, stressful job at the hospital, which I definitely loved. But it could get crazy sometimes. So this became a little side passion, I guess you would say. And if you would’ve told me, in less than a year, I would’ve been able to replace my full salary at the hospital and be able to make a six figure income, and help over 3,400 lives now, I would’ve told you you were crazy, but that’s … Here we are, and just being able to work from anywhere and be on this mission with my sister. I know that all led to us starting “Your Best You”, and really continuing on this journey, not just for health goals, but with really big goals to help a lot of people live their best life. Jessi Venables: Yeah, oh my gosh, well as you guys can tell from just that little snippet of Ali’s story, my sister is an absolute rock star, and I watched her tap into her potential. So I watched from afar, a couple cities in between us, and I watched her not just get into the best shape of her life, but I watched her get really, really excited about life again. So to take you guys back about two years ago, I was getting really good at going to the hospital. My full time job, I’m a nurse, and I work in medical device. I was getting really good at being on this, I call it a hamster wheel, where I was waking up every day doing the same thing, and driving to a job every day that I liked but not loved, making ends meet with the salary I was told I should earn, getting really good at trying to initiate conversations about making some more money or getting a raise, getting really good at saying I was too busy to do the things that I loved outside of work, and getting really good at being tired and exhausted, to be honest. So I definitely had some different health goals as her, but I just knew there had to be more. And so I watched my sister from afar for a couple of months, and I called her one day and said, “Ali, this journey that you’re on, I’m ready for it. Let’s link up, and let’s do really big things”. And thus, Your Best You was born. So a couple months after that, we put our heads together, and we said we really want to impact people, both physically and financially, and give other normal people like she and I, who are all so busy, who are also thinking about, “Is there more out there?” The chance to believe in themselves enough to really tap into living their best life. Tim Mullooly: That’s awesome. Two really inspiring stories, and great that you could do it with a sibling, too. That’s awesome. Just that one call that you made, Jessi. “Hey, I want to get on this journey with you”. Is that how Your Best You got started? Was it a really easy decision for you guys to make? Or how long did that process take once you reached out to get things off the ground and running? Ali Gray: Yeah, honestly, such an easy decision. We were so happy and so lit up. I think actually the awesome nutrition might have a little to do with that, just really excited to help more people. I think the hardest part was coming up with a name that encompassed everything that we were about to do, and because it’s not just health and it’s not just a business, and everyone’s goals are totally different, we wanted to make sure that it included all of those. So I think the longest conversations came about with just figuring out what the name was going to be, and what it would look like. But as far as jumping in and getting to work on it, that happened very quickly. And Jessi being in Boston, and me being in New Jersey didn’t hold anything up. I think we chatted day after day, and just dreamed so big together and had some mentors there along the way. But the idea was born, and everything came about within a few months. Jessi Venables: Yeah, and Ali and I are really big on, we focus on what are the feelings around what we want to achieve. So from the very beginning, it was such an easy decision because we were so excited and so passionate about being able to bless this forward and touch so many people. I always say I want to touch as many lives in my lifetimes as I possibly can. And so, the feelings around what we were going to create are what we focus on and continue to focus on. So not just what goal we want to hit, what number goal, what financial goal, what income number we want to achieve in a year or in a timeline. It’s more about the feelings around what that will feel like to achieve that, or what that will feel like to have impacted that many people. And so from the very beginning, it was such an easy decision, because we had those feelings, and knew that those feelings were what we always wanted to keep blessing forward other people. Tim Mullooly: That’s awesome. I feel like you guys did end up landing on a really good name, because regardless of what their goals are, or what they want to accomplish, as long as it’s your best you, then that’s all that matters. What would you say is ultimately the biggest mission of Your Best You? Jessi Venables: We are really out to really just help people feel amazing. So whether that just be with their physical goals and getting into the best shape of their life, or having more energy, or fitting better into their clothes, or losing some weight, whatever it may be, or just having convenience day to day in a way that allows them to live a mindful, balanced, healthy lifestyle, or tapping into bringing in extra income, and having more choice and freedom to create more memories with your family, or have more choice to leave that job that’s not serving you anymore. Either one, right? Or all of the above. So, you could be in the best shape of your life, driving every day to a job that doesn’t serve you, or have a terrible mindset, or be in a bad space. So what is that, really, right? The health or the shape that you’re in? What does that really mean? And then seeing the other way. So you could be living out your passion everyday or going to a job that you love every day, but if you’re physically not able to celebrate or feel the way that you should or wake everyday feeling good in your own skin, then what does that really matter? So we really feel like those two things go hand in hand, and depending on what people’s goals are, those are always changing, right? They’re always evolving. We get to help people achieve both of those together. Tim Mullooly: I feel like for some people, just taking that first step is really tough, but it’s probably the most important thing. Can you describe just that importance of getting started and taking that first step with Your Best You for a new person joining the community? Ali Gray: I so know what you mean. Change can be a little scary sometimes, but it can also be really exciting. And what we try and do, I think, one of the biggest things that sets us apart, from maybe just kind of getting started on your own, let’s say like fitness routine or wellness routine, or even on your own business, is that we all get to do it together. And there’s something about being surrounded by positivity and mentorship and awesome nutrition and being backed by a company, which I know we’re going to chat about soon. It makes all the difference, and it can make taking that first step just a little less scary. And really, people get that built-in community and that built in belief as they get started, and start to build up their own belief, because I know when I got started, I’m the type of person to jump in and try anything. There really are no strings attached with us. We’re just here to meet people where they’re at and help them live their best life, whatever that looks like. So I was a little scared. I never pictured having my own business, and I also never pictured being able to lose that extra 45 pounds that I tried to for so long. It sounds so crazy now, but when you’re in the right place at the right time with the right people, and just take that first step, that’s really when the magic happens. Jessi Venables: Yeah, I think what’s so cool, when I watch other people just like you, achieve what it is you’re wanting to achieve, right? So I know for me, I wouldn’t be here without watching my sister embark on this amazing journey and seeing if she could do it, I can do it. And so what we’ve created here with Your Best You is a platform and a community where people get to be welcomed into by 2,000 other members, and see that if these people can do it, then I can do it, too. And health and fitness and wellness can sometimes be a scary individualistic thing where you feel like you’re on this journey alone, right? And so being a part of a community that surrounds you with that accountability, and even just examples of other people tapping into their goals, is huge. Tim Mullooly: Yeah, I definitely agree. Having that support system behind you definitely makes things a lot easier, knowing that people are there cheering you on and wanting you to achieve your goals. So you guys also, you have a partnership with Isagenix. Do you want to talk a little bit about that partnership, and how they help you and your community and your members achieve their goals? Jessi Venables: Yeah, something that we’re so unbelievably grateful for, and count our blessings for everyday, Isagenix has been around for 16 years. It’s an incredible health and wellness company that’s changing the world. And they have 16 years’ worth of incredible science and research and studies and information out there about their products that are changing lives, and the efficacy of them, right? So what’s so cool is the product and the system that we use to help rebalance your body and feel amazing and hit your goals, is backed by so much. And what we’ve created around Isagenix is this community called Your Best You, where it’s even so much more than that. So the products that we use are Isagenix. The mission of Isagenix is to help set people free physically and financially, and with Your Best You, it’s just a bigger, greater platform, with a little bit more fun around doing so. What we love about Isagenix, is that it’s network marketing. It’s a term that I think some people have pre-conceived opinions around, and so one of our goals, actually, when we were talking about filming this podcast with you, is that we want to be really bold about it being network marketing because network marketing, once you understand it, is the most incredible profession to be in. And I love it so much. I use this example a lot, because it’s near and dear to our heart. Our dad and my boyfriend own businesses together, and a traditional business model, you have to invest. If you have the capital, right? A lot of money in order to get it started, and a lot of overhead, and probably need some qualifications and have gone to school and interviews and stuff like that. And what we love about this company and network marketing is that, you don’t have to be any certain way. You don’t have to have any type of influence. You don’t have to have a certain amount of success. You don’t have to have studied something specific in school. There’s no interviews. There’s no resumes. What we get to do with this company and with network marketing, is invest in ourselves just a little bit on the food we would’ve consumed or spend money on anyway, and get in the best shape of our life, but have the potential to open up just by doing that. Sky’s the limit, income and business. So our favorite thing about network marketing is that you can be exactly who you are, and really truly achieve sky’s the limit income and success, whatever that means for you. So that partnership is something that has blessed us and our families so much, bringing in a second income, full-time income for me, a six-figure income for Ali. Just knowing that it’s a tool, and it’s a profession that so many people can join us at Your Best You and achieve exactly the same thing we have, with no specific background, is our favorite thing. Tim Mullooly: Yeah, that’s really great. And like you said, just being able to invest in yourself, whatever way that means, is definitely one of the best things that you can do for yourself. No one’s going to make something for you. You got to go out and do it yourself. With that in mind, members of Your Best You, like you were saying, also have the ability to earn extra income on the side, through the community. Do you want to talk about the importance of that aspect, and how it’s helped some of the members get even more focused and even more involved and more motivated to achieve their goals? Ali Gray: What’s so cool is when we are reaching our goals with friends and family and co-workers, and maybe even Instagram followers who turn into friends, we have so much more fun doing it. We find that when people are reaching their goals together, and have that extra accountability, they definitely stick with their goals and start to believe in themselves a little bit more. So Isagenix really puts the icing on the cake there, I guess, in a sense, that instead of spending millions of dollars on traditional advertising, marketing, and distribution to your typical type of health food stores that you would think of, we help people get set up with an online wholesale account. So I think we’re all really down for that convenience of getting things shipped right to our door. I know I am. I spend a lot less time at stores now. Anything that can come right to my doorstep and just save that extra time during the day, I love it. So Isagenix is exactly the same. And instead of spending that income for the distribution, or advertisements or partnerships or things like that, they pay people just like us, who absolutely fall in love with the products, to spread the word with our friends. And it’s something we all do anyway. I know I did. So just being able to do that and get some extra income, and this is really where we kind of see what people’s goals are, because for me in the beginning, just a couple extra hundred dollars a month, would’ve been amazing. I never pictured having a business. Sometimes people reach out and they want to make some extra income so they can spend an extra day home with their children, or plan a very special vacation where they’re going to make amazing memories with their family, or just pay off some student loans. Jessi Venables: What’s so cool about that, too, what Ali said, is the world is moving in the way, the direction of this type of model, right? So I think I can say for myself and for a lot of people, we’re pretty much immune to billboards and advertisements in a traditional way. And the world is kind of moving to this social media, influential marketing world where people are seeing about their brands and seeing about the triumphs and successes and day to day life from the people that they know, like, and trust, and what’s actually working from their friends and family, versus seeing a billboard and going on and purchasing that product. So what better way to feel amazing is then to watch a loved one or a friend or someone that you know, like, and trust, have an amazing, life-changing experience with something, an emotional response to something, and want to join them, and of course, you want to bless that forward to people around you when you feel that way. So it’s network marketing, and the company that we’re aligned with, it’s just, in our opinion, the way that the world is moving anyway. So we feel so lucky to be on the bandwagon in creating something pretty awesome within that space. Tim Mullooly: In terms of my own preferences, is if a friend recommends something to me, I’m much more likely to actually go through with it and give it a shot as opposed to some stranger I’ve never heard from before, like you’re saying, a billboard or something like that. So for you guys, what has been the best piece of feedback that you’ve received from someone through Your Best You so far? Ali Gray: Oh my gosh, it is so hard to just pick one thing. I know in the beginning, just waking up to texts or messages or phone calls from friends and people who are on this journey with us, just saying that they felt their absolute best on their wedding day, or felt so confident on their vacation, and energized enough to be able to play with the kids after work instead of just flopping down on the couch which was the norm, was so, so life-changing for me, because I know that’s how I felt when I got started. I actually physically remember sitting on the beach on my honeymoon, and getting a little sneak peek of photos back from my wedding day, and just thinking, “Oh my gosh, where would I have been? This would’ve looked so different if I hadn’t just reached out to that friend on Instagram”. And that’s when it really clicked, and I knew getting messages from friends feeling just as good, would be even more amazing than me reaching my goals. But now, I feel like even bigger than that, and moving forward with Your Best You, and watching it grow, has also been the messages and the stories that come about with moms being able to stay home with their kids and not miss those special moments with them, or being able to have an extra special Christmas or plan a family vacation with amazing memories that I know they’ll remember forever, that this opportunity has allowed them to do. Or maybe even paying off a student loan that had previously been kind of really crippling what they were able to do in their everyday life. I know there’s going to be so many more stories and transformations like this in our journey, because we’re really just getting started. But that really is what gets us up every single day, excited to reach more people and spread the word about this mission because, oh my gosh. I know I can picture what my life would look like if I hadn’t ordered that box, and I know Jessi would probably agree. But yeah, it’s too hard to pick just one. Those were just a few that really come to mind. Tim Mullooly: Well that’s awesome, being able to touch so many lives in such a short amount of time, too. I just wanted to ask, in a world today that sometimes seems like it gets sucked up by negativity, if you look at the news or the headlines on a day to day basis, how important do you guys think it is to have a community like Your Best You that preaches positivity? Jessi Venables: Huge, Tim, this is something that really drives us, that is the foundation of what Your Best You is created around and those feelings of positivity and gratitude and all of those feelings that continue to grow as you focus on them. I think that it’s easy to get caught up in the negativity, and it doesn’t mean that there isn’t struggles or bumps in the road, or hard days or times that we all feel. It’s just about being able to be a part of something so positive, and something that you can fill your cup back up in, or have accountability with, is huge, right? And I think that, at the end of the day, we’re all in control of how long we spend on that bump in the road or that negativity, right? Whether it be, it ruins the whole day or it ruins one minute. And so I think it begets each other, being around that type of positivity, and if we’re going to be real and raw on this, I think this last year, for me personally, was a big area of growth in this space because, over the last year, there’s definitely been some times where, maybe people didn’t really get me, or maybe I was focusing on some negative that was coming at me, right, which never goes away. But I think the biggest thing that I took from that, that might help some people listening in, is remembering to keep challenging yourself to being around people who are bringing positivity into your life, and if you find that you’re continuing to be around people who make you want to play small, or you’re not being bold and dreaming and talking about the things that excite you or the things that you want to do, you’re probably hanging out with maybe some of the wrong people, right? And so Your Best You is that built-in, 2,000 plus members of people who are on that same journey of really fostering that positivity and bringing more of that back into your life, right? Tim Mullooly: I like that last thing that you said, being able to surround yourself with the right people. It’s huge, definitely a community like this is great for anyone who joins. Appropriately, we’re recording this right around the new year. 2019 has just started. People always like to have resolutions and goals for a new year. How important do you guys think it is for people to have specific, written, targeted goals, as opposed to just an undefined want, or something not really specific? And how do you guys, at Your Best You, help people to find their goals? Ali Gray: Yeah, that’s such a good question. I love the new year as a time to kind of reflect on all the things that went right, and all of the awesomeness that happened in the previous year. But I’m also getting away from the traditional “set those same goals over again” every single year like I’ve done in the past. Ali Gray: They used to sound like, “Oh, I’m going to go to the gym more”. “I’m going to do less of this”, or ” … do more of this”, and I know personally, what I’ve found has helped a ton is focusing on how I want to feel, and it’s what we try and do when we chat with new members and the original members, and all of our really close friends and even business partners at Your Best You, is, yes, this smaller, action steps and goals. Having them written out is so important in having a clear plan, but the most important thing, I think, is a vision, for what do we want our life to look like. And let’s just say, starting with, okay, I want to lose ten pounds, even just thinking that. Yeah, I got started because I wanted to lose some weight. But why did I want to lose that weight? I wanted to lose weight because I wanted to feel so good and so confident on such a special day that I knew that I was going to remember forever. And then once I got that feeling, I’m like, “Whoa, it’s not just about that”. I feel so energized. I feel excited when I wake up in the morning, and I have more time to just hang out after work and not drained or stressed, coming back and just starting it all over again. So sometimes, it’s getting down into the deeper “Why do you want to lose that weight? Or why do you want that extra energy? Or what would that extra income do?” Because that’s really what gets us up and into action, and then of course, breaking it down into the the smaller steps to make it happen, we love that part of it as well. But dreaming big together and just picturing. We made vision boards recently, actually, we had a vision board party right before the new year. It was a virtual party because we have members all over, actually internationally as well, but where we all got together and just put together what we picture happening in this year and beyond. And seeing that vision board and watching it come to life, is going to be so cool, especially with old friends and new friends, along for the journey. It’s so special. So yeah, I think a little combination of both is good, but the why is the biggest part for us, and it’s kind of what we operate from every single day with Your Best You. And when we share our personal journey, it’s not just like the what? The extra income doesn’t mean anything if it’s not helping people along the way, or if it’s not allowing us to really do something we love every day. And losing the weight doesn’t mean anything if it’s not helping us really feel good, and just in alignment. So, that’s actually one of my favorite questions. Tim Mullooly: Awesome, and kind of along the same lines, you guys are constantly highlighting some amazing success stories on your social media accounts, on Instagram, Facebook, on your website as well, through people achieving those goals and getting to where they want to go through Your Best You. Do a couple success stories stick out in your mind that you might want to tell the listeners about? Jessi Venables: Oh my God, yes. There are so, so many. So many come to mind, but again, we’d be here all day. One particular that sticks out in my mind, is the story of somebody who joined us at Your Best You only six months or less in time ago. And in such a short period of time, she has been, she’s just an absolutely incredible person. We’ve been able to grow to such good friends with her, where we call her one of our best friends. And in six months, after joining Your Best You, she has been able to touch so many people, and she’s gone international. And so a little of that back story on her, is she was already into fitness. She had already had an incredible transformation of her own, and was starting on social media to hope to inspire other people and do personal training. Ali Gray: Yeah, all while being home with her two little ones. She has two little ones under the age of three. So, just being able to work at this and partner up, a little bit each day, whether they’re napping or at night, after they go to bed, and be able to make that impact, and really do something she loves, has been so cool. And I was actually thinking of another friend, who we are on this journey with, as well. And at the age of 22, a little different, than being a mama, right? She had actually just left college. And she didn’t finish. She didn’t get her degree, at being a senior. So she was almost there, but she was drowning in student debt. And her family was going through a lot. And when she just kind of took a look at things, she was like, “I don’t know exactly what I want to do with this degree that I’m about to get. I’m not really sure what I picture after this, and I’m going to have so much debt, and I’m not sure that the income’s actually going to totally pay that off in the way I would love it to”. So she up and moved and left school, and started working two jobs plus running a beauty business out of a rented space in San Diego, trying to make ends meet and trying to do something. Obviously, she was super entrepreneurial at 22, trying to start her own business, but was definitely not living her best life. That’s for sure. And Isagenix, and this community, fell into her lap at the time. And she was open to learning more and just jumped in, kind of like how we had done. And oh my gosh, watching her journey unfold has been such a drive for me in really opening my eyes and seeing what’s possible with network marketing. So with no degree, being 22 years old in a new state, and no health and wellness background, she, on the other hand, was not a personal trainer and anything like that. She was able to grow her business. She now makes multiple six-figure income a year, at 25. I remember the day that she actually paid off the rest of her student loan payment in one lump sum, pretty close to $50,000, which I know a lot of people can probably relate to. Student loans are kind of crazy and can be so draining for a long period of time, because most of us are just making enough money at our jobs to pay for the day to day, month to month stuff that we have to, never mind add on this additional kind of loan, because we went to college. And that’s what you’re supposed to do, right? So just watching her be bold and try something new, and really go for it, and create, oh my gosh, such an incredible community. We get to work alongside of her every single day, and obviously, that’s not typical, but it’s totally possible with no experience and no special degree or anything. She kind of just went for it, and that’s what she made happen. And I know Jessi and I both look up to that in so many ways, in knowing that’s what’s possible with this and more. Because she’s just getting started as well, so, oh my gosh, just two stories, but, like you said before, we’re really just getting started, so we’re so excited for more and more journeys to unfold, and more people to reach their goals, whatever they may be. Tim Mullooly: Yeah, just from those two stories alone, it shows the wide scale variety of people that are in the community, too. So that’s a really great thing as well. For someone who might think, “I don’t have time for something like this. I’m so busy in my day to day schedule already”. What would you say to them in terms of being able to find time for something like this, and how can you guys at Your Best You help somebody like that? Jessi Venables: Oh my gosh, you guys, I love this question. I love this question, because this was me, and because all the more reason that something needs to give in your life if you don’t have enough time to do things that you want to do. So I love this question. I still work a full time job. I have two full time incomes with my business with Your Best You, and my full time job that I work, nights, call, weekends, a lot of hours. So it’s not that I have more time in my day, which is why I have a business as well. It’s because I just work smarter, not harder. And I have that drive to create more freedom and choice in my life, right? So if somebody feels that way, I love it, because it’s my favorite thing ever. That’s all the more reason that you need something like this in your life, right? My favorite thing to tell people is, “It’s not about feeling like you don’t have enough time to do the things you love or can’t”. It’s about living a healthy, balanced lifestyle that’s easy and convenient, which luckily, the products and the system that we use make it easy to hit your health goals and not spend any more time on it. That’s why we’re obsessed with it. But the financial piece of it, it’s about putting a little bit of time here and there in the pockets of your already busy day, which we all have, to create and level up something that allows you to have all the choice and freedom that you want and deserve. So it’s about putting in some time now, that you can have the fruits of your labor later, right? And so whether that be continuing the job that you love, or just having more additional income, or because you’re so busy, and the job you’re going to doesn’t serve you, or the things that you’re busy with aren’t serving you … Well do a couple things here and there that allow you to have ultimately that choice to design your day the way that you want to design it. And that’s our favorite thing, and we talk to people all the time about it. What’s the day you could dream up for yourself? And here are the actions steps and some of the things that you could do with us and partnership in Your Best You and built-in mentorship, in us and so many others, to set yourself up to have those things, and maybe not be saying that you’re so busy anymore. Something I never say is, “I’m so busy”. I have two full time jobs. So all the more reason that we love to chat with people who feel that way. Tim Mullooly: Right, and it kind of goes back to that term you said before about investing in yourself. This might be a kind of difficult question for you guys to narrow down. What has been the most rewarding thing for you two, personally, throughout this journey, so far with Your Best You? Ali Gray: Oh my gosh, you’re right. Tim Mullooly: There’s probably so many. Ali Gray: So hard, but I guess just overall, it started out as us reaching our goals, and really, now the more people we help reach their goals, the more our goals grow. And the more our accomplishments grow, and that’s a win-win for everyone. So the more we can help people elevate their life and feel so amazing, and just do what they want to do more of, then we get to watch our community grow, and we get to watch our business grow. And just, oh my gosh, I think that’s the most rewarding thing about this. It’s not just about us, or Your Best You, but really, those stories that we shared before, those text messages that we get in the morning. Those are the most special things I think. I couldn’t have even imagined it when I got started, because I did have some of those more minute goals that I was thinking of, and just watching it unfold and really be more about the life-changing experiences that are happening and the friendships. I know Jessi mentioned it, but we have met so many incredible mentors, that are also friends, that are business coaches, health coaches, all wrapped up in one. And I can’t really picture another place that you get all that for free. I don’t know if we mentioned our community is free and open to everyone. So there really are, there’s just only so much to gain, really, nothing to lose when people reach out. Jessi Venables: Yeah, and just to echo what Ali said. There’s so much. It’s actually unbelievable to think about, but I think indirectly or directly, Your Best You is impacting so many people, and indirectly serving and giving back to this world in more ways than I could’ve ever dreamed of doing or even had the means to do. So I think that in every single way, this is impacting people directly with this nutritionist community, the income, the opportunity, and indirectly with all of the service and love and mission that we’re all able to generate back into this world. That’s what it’s all about. Tim Mullooly: That’s really great, and I applaud you guys for all the work that you’ve done so far. I have just one more question that I like to wrap up with each guest. Both individually, it could be either a personal thing, professional thing, or both: what’s one piece of advice that you’ve received that’s kind of just always stuck with you? Jessi Venables: I love this. You know why? I think that we’re so fortunate, to get a little bit deep here, there are people all over the world that I’ve seen, first-hand, that don’t even have the privilege to pop in some headphones and listen to a podcast like this, Living With Money, and be inspired and motivated from people around them who are creating content and development for them to tap into. There are people who are being sold by their families for money. There’s so much to be grateful for in the world that we’re in, and I think that there’s so much we can, I guess, soak up, and go embark on this journey professionally and personally. I’ve been so lucky to be exposed to people like Tony Robbins, and we work one on one with mentors of ours that are pioneers in the network marketing industry, that we’re lucky to call friends. And I think that it’s not so much just being able to listen and be surrounded by these things, which is so so important, I think the biggest thing is actually believing in yourself enough to take the action steps and do the day to day action items that these people are doing to achieve where it is that you want to go or where they are, where you want to go, right? So I think one of my favorite quotes is “Get out of your head and into your heart”. It’s something we live by every day. Just getting out of our head and leading with our heart and our why and our mission to impact so many people. But it’s not just that saying and being inspired by it, right? It’s about taking that motivation to take the action steps to achieve, do the day to day things to achieve the things that we want in life in a way that feels good for you. So if there’s one thing that I think Ali and I were hoping to get across in this podcast, was really just hoping that just normal people like she and I, feel inspired by some of the things we said, but more importantly feel motivated to maybe take some steps to really achieve what it is that they want, that’s on their heart, and to really get out there and live an extraordinary life filled with so much love, passion, purpose, just so much goodness. That is our mission here. So we could say a million quotes and things we’ve learned along the way, but I think the biggest thing that we did was take our life by … the bull by its horns, or whatever that saying is, and really just decide to go for it. Ali Gray: Yeah, and to honestly not worry about it getting a little messy along the way, or having those days where you feel a little stuck, just getting right back to it. And being surrounded by people that believe in you in huge, but you have to believe in you. And even if there’s just a little, tiniest little inkling, or a tiny little tug on your heart to do something, or to dream a little bit bigger, you got to do it, because the days are passing. The minutes are passing for sure, and we’re really all just getting started on this, and if you’ve been thinking about something. If you’ve thought about it more than a couple times, it’s time to just go do it. Day after day, whatever it is, those little steps, go for it. And you’ll find people that support you along the way. If people don’t, it’s okay. Keep moving. There’s going to be people who maybe doubt you, but it’s more about what you believe in, and what makes you feel so good and lights you up, and you get to do that every single day. You’re so worth it. And we’re so excited to just see so many people reach amazing goals in 2019 and beyond. I know it’s going to be such an incredible year. And we’re so grateful to be on here. Jessi Venables: Yeah, go get it, baby, honestly. Thank you so much. We’re so excited, and we hope that this hopefully inspired and spoke to some people out there who are just like us. Tim Mullooly: Absolutely. Thank you, guys, so much, for coming on the show. For listeners out there, I’m going to link in the show notes, to Your Best You’s website, their social media, platforms where you can get in contact with Ali and Jessi. Guys, thanks again, for coming on the podcast. I really appreciate you taking the time to answer some of my questions. Jessi Venables: Thank you so much. We’re so excited. Tim Mullooly: Alright, guys. Thanks for listening to this episode of Living With Money, and we will see you on the next one. If you would like a PDF version of this transcript, please follow the link for a download!